As you can see below, I have no shortage of toys. Believe it or not, I have yet ANOTHER basket in the other room filled with catnip smousies and balls too. Alas, many of them are hand-me-downs from Nicky and Autumn. Some are prolly even Faith and Big Tym rejects. 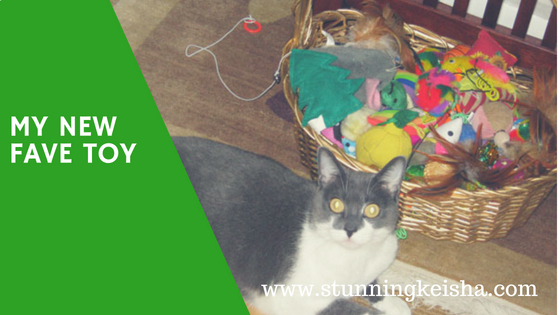 So, with all these toys, what—you may ask—does Keisha like to play with the most? My current fave is a straw that The Woman brought home from Dunkin Donuts. I love batting that straw around. I also like when TW shoots those coated hair bands. I will run to the spot where I think it'll land before she even starts to shoot it. Another fave is the safety wrapper that comes on vitamin bottles. They make a cool crinkly sound in the middle of the night. Another great toy is a few sheets of tissue paper or part of a paper tablecloth laid just perfectly on the floor so I can dive under it. Don't even think of invading Fort Keisha or I will attack. I also like interactive toys like smousie lasers that TW has to be involved with. Sometimes she'll blow bubbles and I'll try to pop them. Well, at least I'll stare at them. Cod knows I don't want her hanging around getting into trouble by herself. Next thing you know, she'll think she has a life! Let me know what your fave toys to play with are in the comments. And TW better not get the wrong idea. Come Christmas, I expect to see lots of expensive catnip toys under the tree for me. I'm asking for a plague rat among others. Hai mai sweet furriend! Thanks you for adding my link, I will add yours to mine. I fink you deserves da bestest toys Keisha! 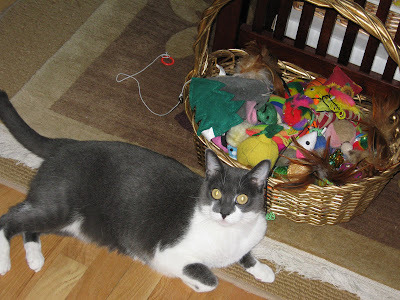 These are my favs - Da Bird, Any Yeowww Catnip toys, Turbo Track, Springs, and Plague Ratsies of course! MOL You knows where to finds all of these...in our store!